Limestone is a stunning choice of stone which can add an element of elegance and sophistication to your home. However, like most Natural Stone floors, Limestone will wear and show signs of aging. At Infinity Flooring, we specialise in restoring natural stone flooring back to their full potential. Our expert team will use their wealth of knowledge and experience to rejuvenate your limestone pavers and tiles back to look as good as new. Whatever your flooring needs, get in touch today for a no-obligation chat, and take the first step towards transforming your space today. Limestone tiles and flooring is a stunning choice of natural stone which can add an element of elegance and sophistication to your home, office or commercial premises. The subtle coloration of limestone floor tiles and pavers can match nearly any interior décor, and this natural stone’s sheer durability means that you won’t be spending hours per month on maintenance. Limestone flooring and floor tiles have a reputation for being able to withstand the test of time and harsh elemental pressures. Whilst this is the case, grime, dirt, and environmental factors can build upon the natural stone, spoiling the appearance and the overall look. Your perfect limestone floor is dirty, a far cry from its original glory. The expert team at Infinity Flooring, are commercial and residential Limestone Floor Cleaning, Honing, Polishing Contractors. We specialise in restoring your limestone floor tiles back to their full potential. 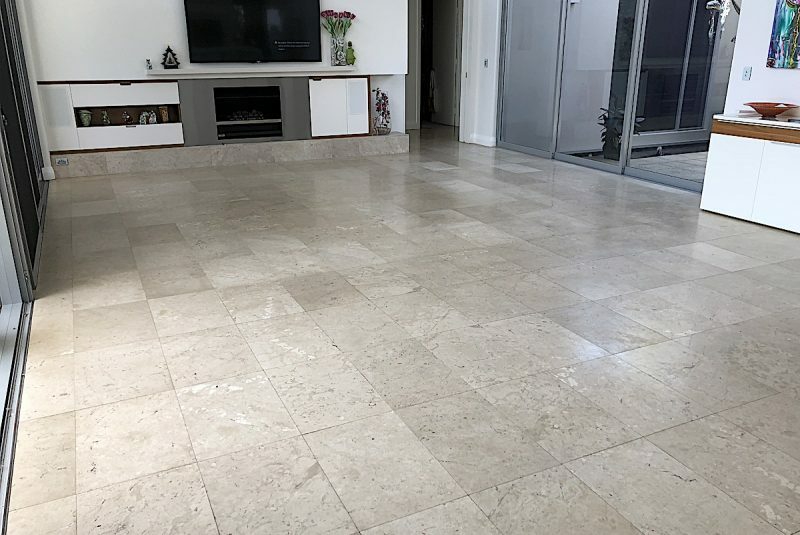 Our expert team of contractors will use their wealth of knowledge and experience to hone, clean, polish and seal your limestone floor tiles until they look as good as new. We see every customer as an individual and pride ourselves on offering a bespoke and personalised service, focused entirely on what you need from us. It is highly recommended that your limestone be pre-sealed prior to being installed. Soluble salt is often found in limestone, and this can have an impact on discolouring the stone during the installation process. Even if your stone does not require pre-sealing, it is still recommended to apply a layer of limestone sealant prior to grouting. This helps to act as a grout release and helps during the cleanup process. This is particularly important with limestone, as acid-based cleaners will mark and stain the stone. If you need a quote regarding the pre-sealing of your limestone floor tiles, contact Infinity Floor Restoration Services and we will be more than happy to provide you an obligation free quote and advice. Due to the porous nature and chemical sensitivity of limestone, limestone stains can be tricky to remove once they are set. This could result in a large and unwanted mark immortalised on your limestone floor or having to use rugs or coverings to hide unsightly stains. In addition, carbonates – of which limestone is an example – react to acids such as those found in fruit and cleaning products which are not alkaline or pH-neutral. This can lead to warping and discolouration that could ruin your limestone’s finish. If you are using limestone as flooring, the weight and movement of feet day after day will also have a wearing effect, which can spoil the look over time. Limestone is a material which is prone to absorbing stains, but the good news is that there is an easy way to protect your stone: by sealing it. Limestone sealing offers a barrier against environmental damage such as cleaners, dirt, and stains, and makes limestone cleaning an easier process. This will help your limestone flooring keep its colour, as well as protecting it from dirt, grime, and daily wear and tear. Limestone seal has the added advantage of making day to day maintenance cleaning easier; sweeping and mopping will become a breeze on a freshly sealed limestone floor. Cleaning your limestone floor tiles is a large part of essential floor maintenance. Before treating your limestone floor in any way, it is important to start with a thorough limestone deep clean and stain removal. A special limestone tile cleaner is necessary to remove limestone stains without damaging your limestone floor tiles. Here at Infinity Flooring, no job is too big or too small for our professional, expert team. We promise “Fully professional, safe, fast, and affordable” services, and that is exactly what we deliver every time. Whatever your flooring needs, get in touch today for a no-obligation chat, and take the first step towards transforming your space today. We focus on putting clients at the heart of our business and specialise in providing high-quality service and results to leave you satisfied. You can relax in the knowledge that your flooring is in the hands of experts.